Hercules has a home with his new family, Chris, in Iowa! 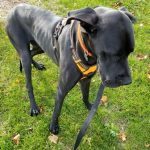 Hercules will be Chris’s 3rd Dane, and he is so determined and dedicated to helping Hercules with his Wobbler’s while giving him a loving, and supportive home. Chris has experienced medical issues before with both of his previous Danes, and understands that patience is at the top of the list for what Hercules needs in a family. Hercules will be the only dog in Chris’ home, and will enjoy all the love and attention! Chris will be continuing the great care that Hercules was receiving in his foster home, and will seek out more ways to help keep Hercules comfortable, and mobile. We are so excited for this sweet boy!